Why, then, did the National Gallery agree to participate in this secrecy on the ownership of a painting whose (contested) Leonardo ascription had been supported by the gallery’s own director; by one of its curators; and, by one of its trustees? Another of the scholar-supporters of this upgraded Leonardo is Professor Martin Kemp. In 2011 Kemp told the Sunday Times how he had been invited to view the work by the National Gallery (“there’s something it’s worth you coming in to look at”, was how Kemp put it). 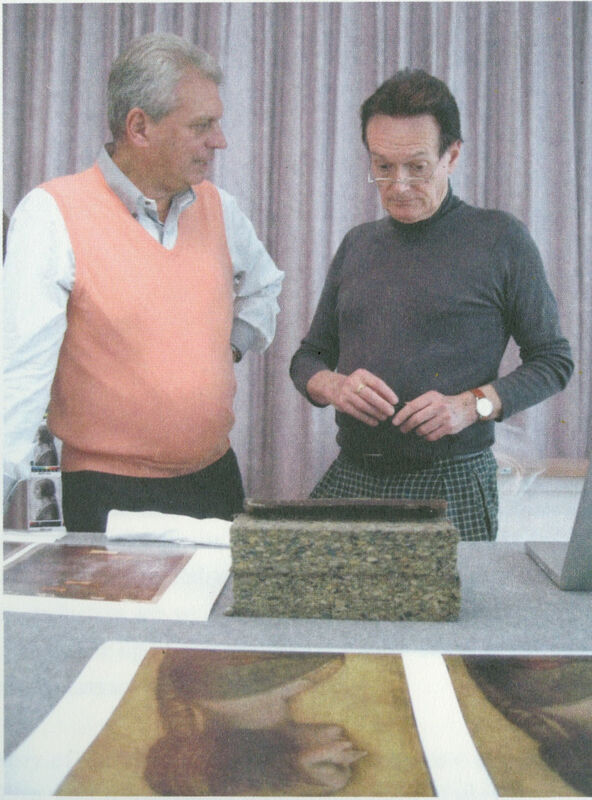 Kemp described entering the National Gallery’s conservation studios and joining “a little group of people, including some Leonardo scholars from Italy and America, and Robert Simon.” Robert Simon had been accompanied on that trip by the Salvator Mundi’s restorer, Dianne Dwyer Modestini. In 2012 Modestini would deliver a paper on the picture’s (then) two restoration campaigns at a conference held in the National Gallery. On April 6 Buffalo News reported that Dianne Modestini was to speak on April 9 in the Burchfield Penney Art Center at SUNY Buffalo State and was about to make two new claims. 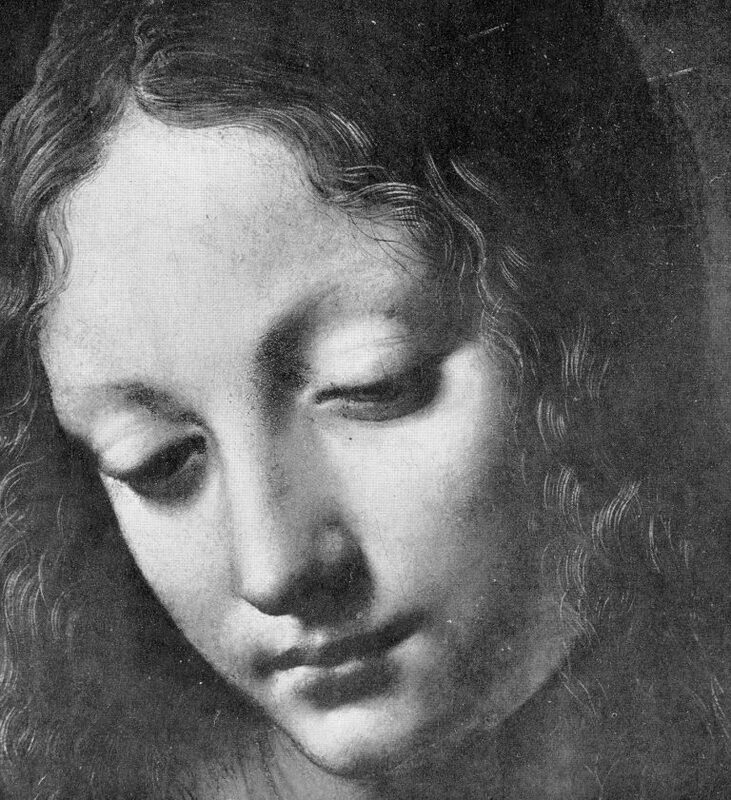 Those present at her lecture might have learnt why a painting that had so soon revealed itself as an autograph Leonardo to two experienced restorers and in which “apart from the discrete losses, the flesh tones of the face retain their entire structure, including the final scumbles and glazes” had needed a third campaign of restoration with substantial repainting of the face, some time between 2016 (when the Qataris reportedly turned down a private offer of the painting for $80m) and the spectacular $450m sale at Christie’s on 15 November 2017 amidst modern works, not old masters. “On 5 March 2008, my birthday, an email arrived, announcing the appearance of a new Leonardo – a painting rather than a drawing […It] came from a well known source: Nicholas Penny, then director of the National Gallery in London. 1) The method of inviting successive select groups of scholars to see and appraise the painting in the prior knowledge of others’ support for the new attribution might be thought to have fallen short of the National Gallery’s own practices. When Nicholas Penny, as a curator at the National Gallery, proposed the Northumberland version of Raphael’s Madonna of the Pinks as the original painted prototype of the very many versions, he first published a thorough and well-received scholarly article in the Burlington Magazine, and later invited a group of some thirty Raphael scholars to discuss the matter during a day-long symposium at the National Gallery. 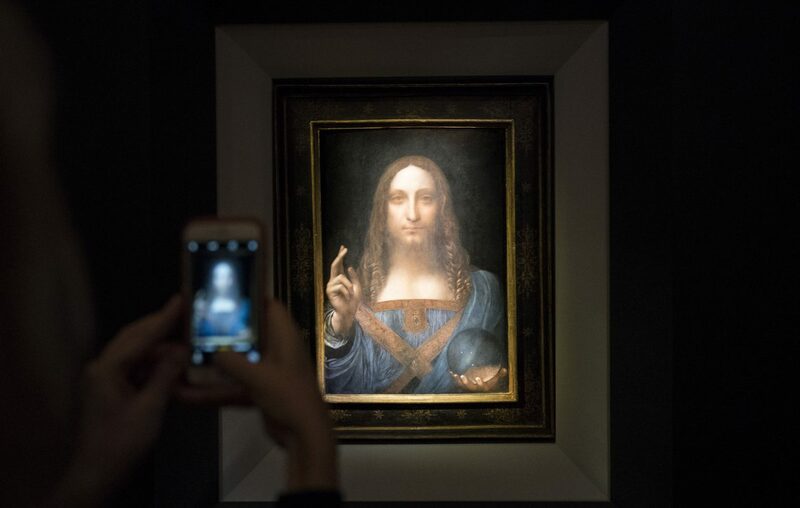 Carmen Bambach rejected the Leonardo attribution in a 2012 Apollo review of the National Gallery exhibition and gave the painting to Leonardo’s student Boltraffio. Ironically, the Times reported on 9 April 2017 that Kemp has now demoted the Hermitage Museum’s Litta Madonna (which was included as a Leonardo in the National Gallery’s 2011-12 exhibition) from Leonardo to Boltraffio. Thus, Modestini had intervened radically on the painting shortly before it was included in the National Gallery’s major 2011-12 Leonardo exhibition and two years after it was appraised by selected Leonardo scholars at the National Gallery. Above, top: The head of the Virgin in the National Gallery’s (second) version of Leonardo da Vinci’s The Virgin of the Rocks, as published in 1944 in Kenneth Clark’s One Hundred Details from Pictures in the National Gallery. Above, the Head of the Virgin as published in the 1990 re-issue of Clark’s “Details” book and, therefore, after its post-war restoration by Helmut Ruhemann but before its more recent re-restoration by Larry Keith (in which the mouth of the Angel was altered, on Luke Syson’s advice, as discussed here in “Something Not Quite Right About Leonardo’s Mouth ~ The Rise and Rise of Cosmetically Altered Art”). 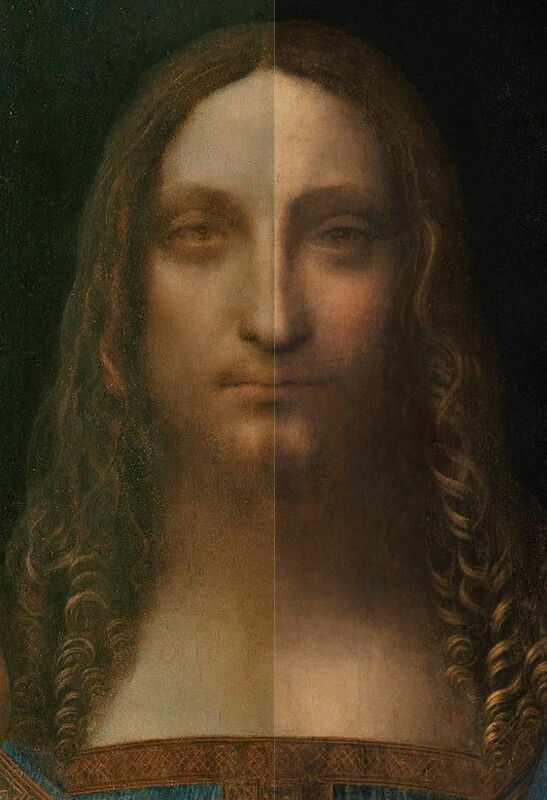 Above, the face in the accredited Leonardo da Vinci Salvator Mundi, as exhibited, left, in the National Gallery in 2011-12, and, right, as when sold at Christie’s in November 2017. Where would we be without a free and vigilant press? 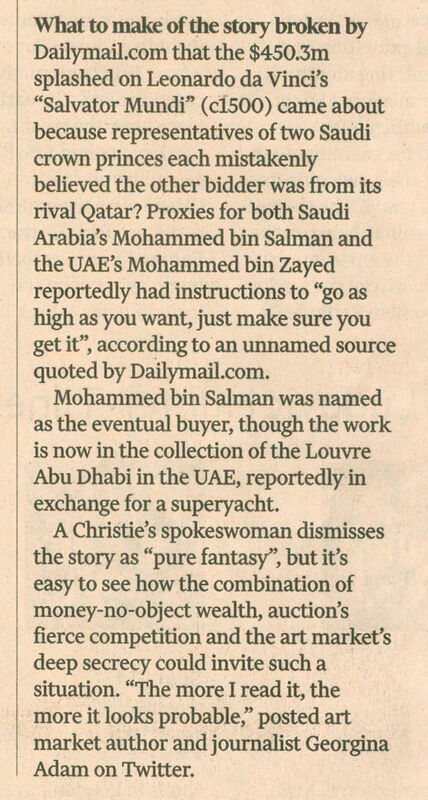 Where, precisely, is the $450m Salvator Mundi today?